"I also want to thank you for your two wonderful books! Bringing light to Harry's teaching is invaluable to the horse community, and the horse itself. I especially appreciate your honesty as you explore the often frustrating experience of learning what you didn't even know you should know! Only being able to see and work with Harry once or twice a year, it is great to have something in print to go back to when I feel a creative "rut" coming on in my training. I recommend your books to all of my clients, and hope you will continue to document your journey." "I am now 3/4 of the way through "Between the Reins" - it is very hard for me to put down. You articulate so well the thoughts, perceptions and brain-twisting "try-to-figure-it-out" processes that I have gone through while observing a master and clinician such as Harry. "Utilizing your thoughtful descriptions as stepping stones on the path that I am on in my own horsemansip journey, I am newly inspired to attempt - again and still! - to refine my focus and intent with my own very talented and sensitive gelding. He humbles me every day, and so deserves that clarity from "mushy" me! "Thank you for your work, for myself and for the horses,"
"The two books arrived promptly thanks very much. "I have read both of them now (in addition to the first one I purchased some time ago). I wanted to tell you I’ve hugely enjoyed the account of your horsemanship journey and especially the work with Harry. I was fortunate to attend as a spectator, two of Harry’s clinics organized by Ross Jacobs earlier this year in Melbourne. So having had some contact with Harry and his work, it is great to have the reminders of his skills in your books. At the time I didn’t have a horse to take to the clinic though Ross did say he could have found me one! Aaaah – what an opportunity missed? I remember clearly the changes I saw in the horses at those clinics and the way Harry went about making things clearer for them. We enjoyed his banter too – it makes it so easy to learn. "Keep up the good work with your horses and writing. I hope there will be more books in the future so that Harry’s teachings are in print forever." "I really appreciate the way you describe the situation as it looked...as it unfolded with some background etc.... You help to make this clear as you write what goes thru your mind and then explain what you have been missing or nailing. "It is very nice that you don't always "get it!" right off the bat. You help us to understand Harry and his method of teaching. The best part about it is that it is in my library quickly accessible and legible! "I enjoy your books. I save them for the cold winter days.... Without your book, I would still be laying awake nights trying to make sense of it all! Without a deep understanding it is very difficult to feel confident in applying some of these concepts here at home should they be to our horse's benefit. "Thank you for your efforts in elaborating your trials and successes. ...Please let me know when your next book is available! You are providing a great service to all of us." "I’m nearly finished with your book, but I just had to write and let you know how much I enjoyed reading it. You sure have a way of writing that draws readers in and really makes them feel like they are riding right next to you. Although I’m glad I wasn’t with you when you went past the trampoline! Wow. But I really appreciate how you help us learn along with you. Rather than coming off as someone who knows it all and has nothing more to learn. That really bothers me about some trainers. No one can know it all about any important topic really. "I just wanted to let you know how much I’ve enjoyed your writing. I’ve enjoyed reading other articles published in some of the magazines you write for, but this book will become a lasting part of my equine library. "I am sure you will find each of Tom's essays and chapters entertaining and enjoyable reading, as his commitment to truth comes across in his writing. Tom takes great care to get "it" right. Thank you, Tom, for your commitment to horses, to horsemanship, to honesty and accuracy, to journalism, but most importantly, to us your readers." "What a unique and utterly refreshing approach to the topic of Natural Horsemanship. In a genre flooded with overbearing tomes that spout trademarked catch-phrases, Tom’s book stands out as a truly enjoyable read, with the added benefit of being incredibly informative. 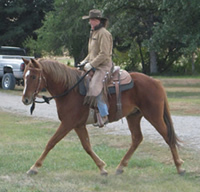 Rather than simply telling us what Natural Horsemanship is all about, Tom invites the reader to learn along with him. The journey is fascinating. One of the most open-minded, inquisitive and contemplative people you’ll ever meet, Tom is continually asking “why” and gives careful consideration to each and every answer he receives. When he turns his attention to horses and so honestly shares with us what he discovers, the result is a gem of a book." "Tom Moates brings a fresh perspective to the topic of natural horsemanship, and has a way of renewing a reader's interest in the subject." "Tom's book brings back memories to those who have been there and done that, and prepares novices for what challenges may lie ahead. He bravely shares his own learning experiences with what he calls the Better Way, providing helpful tips, techniques, and training information. But he makes it clear that the human and the horse-human relationship develop together, and continue to develop. The way Tom presents these developments as they happened is what makes this book so fun to read - you won't want to put it down, and you will definitely learn something!" "Discovering Natural Horsemanship" is a true find: a honest, thoughtfully told story of horses' ability to test us, teach us and ultimately fulfull us. People seeking better relationships with their horses -- no matter what point they're at on the journey -- will relate." "This is the story of a writer’s journey that turns to admiration and respect, sharing one man’s curiosity with horses and what he learned along the way. It is a story without an ending. Nor should there be one, for Moates weaves his personal observations of horses and their nature with his own human awareness, which the reader understands will be ongoing. As Moates writes of his growing relationship with the mares, Soke and Niji, his heart, as well as his humor, comes through in his words. This is an authentic odyssey of one man’s discovery of nature—heartfelt and very inspiring."